I had the pleasure of attending my very first tea party with Liz on Saturday. 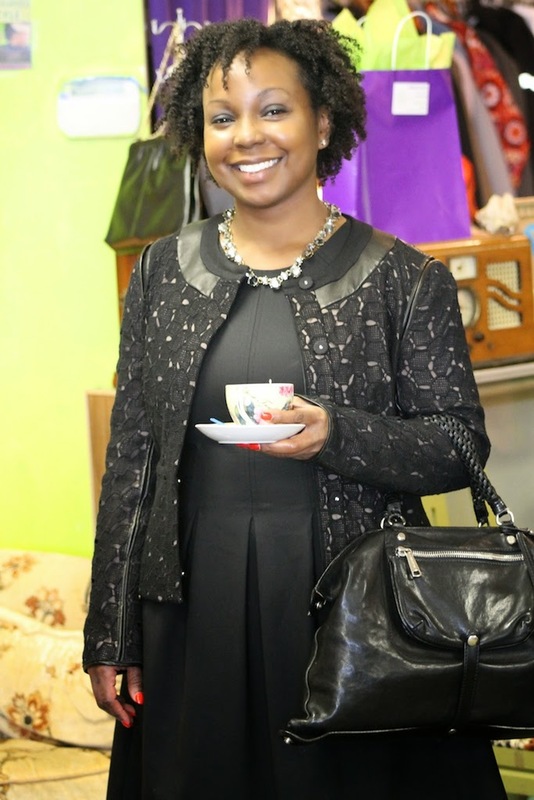 Liz is the Detroit Chapter leader for Girls of Royalty and decided the Breakfast at Tiffany's inspired tea party hosted by a vintage store, Flossy's suitcase would be a great event for the Royal Girls to takeover! I quickly agreed and was very excited to attend. The store owner, Ramona was a sheer delight and the beautiful 14 year old Christina was a very gracious hostess. I really had a great time and cannot wait to attend the next one. Liz and I even won the raffles. We had a grand time sipping tea and chatting with new and old friends. While there, we browsed and shopped the fabulous pieces in the store! Such great finds! If you're in the metro Detroit area, be sure to check out Flossy's suitcase for fabulous vintage finds. Want to see what I wore? Check out my post here!